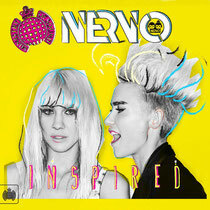 The second in Ministry Of Sound’s ‘Inspired’ compilation series comes from Australian DJ/producer duo NERVO. Having first established their credentials writing hit records for the likes of Armin van Buuren, Ke$ha and even Kylie Minogue, as well as writing David Guetta & Kelly Rowland’s Grammy award-winning single ‘When Love Takes Over’, NERVO now aim to try and position themselves as one of the most exciting dance music acts in the world. Having enjoyed a series of Billboard and Beatport #1 hits including ‘Like Home’ alongside Nicky Romero, a track that topped the charts for three weeks and has since amassed nearly 10 million views on YouTube, 'Hold On', and the recent track ‘Revolution’, their inaugural full length outing for Ministry Of Sound thus represents an exciting landmark in their career. There's a whole host of classic club tracks from across the wider reaches of electronic music soundtracking their “Past Inspirations” Mix, including Fatboy Slim’s iconic ‘Praise You’ and the late Frankie Knuckles’ seminal house jam ‘Your Love’. Looking to the future, the duo take in a selection of upfront dance floor cuts right across their “Present and Future Inspirations” mix, offering up tracks from the likes of Deorro, Steve Aoki, Showtek and Mercer, as well as UK duo Dusky and a slew of their own exclusive material. The duo’s selection is a decent follow up to Tommy Trash’s debut ‘Inspired’ piece for Ministry Of Sound.